Having a patio, a garden or a terrace without some garden furniture surely does not make any sense. 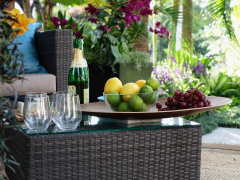 With a selection of garden furniture you will be better able to enjoy your outdoor area. At Radway Bridge Garden Centre we can offer you a vast selection of Hereford garden furniture to choose from. There are several styles and materials to suit anyone’s preferences and budget. Radway Bridge Garden Centre offers an interesting range of benches made from wood or steel. There are many chairs to choose from as well, and of course, tables. Patio sets are very popular and you will be able to choose as many chairs as you like, depending on the area you have available and the number of seating places you prefer. 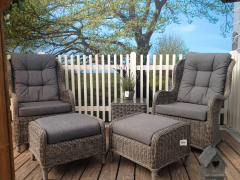 In our garden centre you will also be able to find loungers, swing seats, hanging chairs and Adirondack chairs. Parasols are another popular option in our Hereford garden furniture selection. Thanks to a parasol you will be able to have a shady spot in your garden or patio – something which is a must in the hot summer months. There are various types of parasols to choose from, including upright models and the cantilevered models which are also quite popular. To make our range of garden furniture more inviting and comfortable, we have also thought of offering you a nice selection of soft furnishings as well. There are waterproof cushions for your benches and loungers, outdoor beanbags and anything else you may wish for to make your outdoor seating even more comfortable. 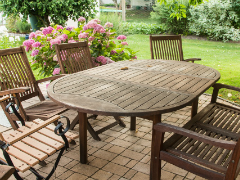 Our Hereford garden furniture range is not only stylish but also durable. We only offer the highest quality materials and yet, our prices are very competitive. Pay us a visit any day - we will be looking forward to assist you in your buying decision so as to turn your garden into a relaxing outdoor spot for all the family.